Home / Articles / 2018 / What's Next After Clean Label? Food companies have been hit with a "big is bad" bias that often makes it difficult to earn consumers' trust. While the growth of clean labels has started to rebuild relations with consumers, what else can food and beverage companies do to regain trust? After an era of secrecy – where co-manufacturers were never named, company plants were identified by some inscrutable code and country origins of ingredients were shrouded – food and beverage processors increasingly are parting the curtain, as well as showing their social conscience. Farmers' names appear, charitable works are trumpeted and the Earth is being cared for by large and small processors alike. And they’re showing extreme concern for the consumer. Companies promise they're protecting consumers from GMOs, allergens, pesticides, carcinogens, synthetic colors, hormones and any other issue that could be a hot button for millennial moms or aging hippies. "Whether rewarding a company’s fair-trade labor practices or zero-waste policies, millennials are the most serious about ethically sourced grab-and-go foods," says Chicago-based Culinary Visions Panel. From environmentally friendly business practices to cage-free eggs to fair-trade coffee, "this generation does not want its dining choices to have unintended negative consequences," says the panel's executive director Sharon Olson. "Sales of conventional products are declining, while sales of products touting simple, clean, sustainable and free of artificial ingredients are on the rise," Nielsen (www.nielsen.com) reports. Millennials and Gen Xers are more likely to seek organic, non-GMO and hormone-free labels, as are households that make more than $100,000 annually, the firm adds. "Today's consumers want to be better informed," explains the Hartman Group (www.hartman-group.com). "They want to know what’s inside, how it was made and who made it before they buy. Consumers increasingly view sustainability and corporate responsibility — from organic ingredients to animal welfare to company treatment of employees and energy conservation — as aspects of quality." Each consumer seems to evaluate different, often multiple, attributes to determine if a product meets their personal purchase preferences. Food manufacturers are telling more in-depth product stories on their websites, blogs, packaging, advertising, social media, mobile apps and via the digital SmartLabel. The SmartLabel platform uses an on-package QR code, read by a shopper's cellphone, to take the consumer to the web to share detailed information on ingredients, sourcing and other issues that could be relevant to the consumer. Some, like Hershey Co. (www.thehersheycompany.com), helped launch a cross-industry consortium called the Consumer Information Transparency Initiative, a group of packaged food companies that share ingredient and sourcing information online to regain consumer trust, notes Deborah Arcoleo, Hershey's director of product transparency. Hershey also delved into the subject on its own. “We did a lot of consumer research [last] spring and worked to identify how consumers viewed transparency, what sources they trusted, the leading pain points, and the ‘must have’ data versus ‘nice to have’ information,” Arcoleo explains. The increase in food allergies was one trend that loomed large in many of the responses. Evolving from clean label, clean living ranks first on a list of consumer trends from Euromonitor (www.euromonitor.com/usa). Mobile technology and internet accessibility play key roles in shaping a clean lifestyle, and clean foods are an essential element. Such an additive-averse, minimalist lifestyle is especially influencing millennials and Gen Zs, not only in food, but in their choice of household items, cars and living spaces, Euromonitor discovered. These groups embrace mindfulness and betterment, favoring reducing harm to themselves, others and the world. Euromonitor calls them Clean Lifers. They prefer things in moderation, drink low- or nonalcoholic beer, preservative- and flavor-free carbonated waters, free-from granola bars and won't touch artificial colors. Clean lifers are passionately worried about chemicals. Studies have uncovered carcinogens even in organic products. Glyphosate, the widely used but controversial agricultural herbicide, was found last summer in trace amounts in a number of foods, including 10 of 11 samples of Ben & Jerry's ice cream, according to the Organic Consumers Assn. As a result, consumers have pressured product manufacturers to seek reassuring certifications that their products are free from such chemicals. For glyphosate specifically, two groups rose to the occasion. BioChecked (biochecked.com) of Sarasota, Fla., launched its glyphosate-free certification program one year ago. So did The Detox Project (detoxproject.org), a Bulgaria group with a Los Angeles office that started out testing humans for toxic chemicals and heavy metals. Initial queries about its testing program met with "shocking interest in the U.S., and even more in Europe," according to Henry Rowlands, director of the Detox Project. Each firm is largely a marketing organization that outsources the testing to certified laboratories. Both the EPA and FDA started looking into the issue of glyphosate residue in foods but suspended research. Non-GMO certification –whether by the Non-GMO Project, another third-party inspector or proclaimed by the processor itself – is well established. The Non-GMO Project, which has been around since 2007, claims more than 3,000 brands representing over 43,000 products and more than $19.2 billion in sales. While the Non-GMO Project used to be the only satisfactory certification, a number of companies, including Nestle Foods USA, now simply are making their own declarations that their products are GMO-free. "Clean Lifers enjoy going out and socializing, but they want to be healthy, so many of them are turning their backs on alcohol," notes Kevin Kilcoyne, vice president and general manager of global ingredients at Welch’s Foods. "An opening exists for products such as ‘mocktails’ – stylish beverages that look great and contain delicious and nutritious ingredients." Diageo Plc, owner of the Johnnie Walker, Captain Morgan and Smirnoff brands, recently invested in Seedlip, a sophisticated non-alcoholic spirits maker. Dutch brewer Heineken is only the latest of the major brewers to launch low- or no-alcohol beer, proving major companies see the importance of the increase in sobriety and want to enter the clean living space. Clean labels are also moving beyond a product's health impact and ingredients to its environmental impact, sustainability, ingredient and labor sourcing and company ethics. Nearly half of grocery shoppers participating in a recent EcoFocus Worldwide trends study said they purposely didn't buy products from companies whose practices were not environmentally responsible. Some 65 percent of Americans interested in food ingredients are urging food manufacturers to more carefully pick and choose product ingredients, reports Packaged Facts (www.packagedfacts.com). Consumers view sustainability and corporate responsibility — from energy conservation to animal welfare and company treatment of employees — as aspects of quality, not just a “feel-good factor, says the Hartman Group's 2017 Sustainability Report. "Seventy-one percent of consumers say when making purchasing decisions, it's important [product manufacturers] avoid inhumane treatment of animals," the report notes. "Labor and environmental contamination have become more salient issues." The report also says consumers consistently value sustainability attributes such as toxin avoidance, animal, fair labor practices and minimizing pollution. 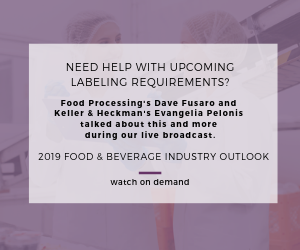 Food and beverage manufacturers are responding with more public-facing communications about their ingredient sourcing, manufacturing practices, ethics and agricultural partnerships with farmers. General Mills says it's making Annie's snacks using organic ingredients from regenerative farms in Montana, picturing the farmers on Annie's packaging. Enjoy Life Foods, a leader in the allergen-free category, in April became the first food company in the U.S. to receive Palm Oil Free Certification for its newest product launches. Palm oil is the most used vegetable oil in the world, but "bad players" have tarnished the ingredient's reputation by rampant deforestation, primarily in southeast Asia, endangering protected species of animals and displacing indigenous peoples. Despite the Roundtable on Sustainable Palm Oil's efforts to end such practices, the oil has gotten a black eye, especially in Europe. Enjoy Life's move is an interesting one -- it simply replaced palm oil with other oils – and is not much different than replacing aspartame with stevia -- but getting certified by some World Aspartame-Free Organization. But the marketing value is priceless. "Our goal is to demonstrate that there are opportunities to create delicious foods without having to utilize an ingredient that increasingly more consumers are looking to avoid,” says Joel Warady, general manager and chief sales & marketing officer at Enjoy Life Foods – and a member of Food Processing's Editorial Advisory Board. Hershey recently announced a $500 million investment to build a sustainable cocoa supply in Ghana and the Ivory Coast, and aims to acquire only certified and sustainable cocoa by 2020. In March, Mondelez announced the Oreo brand would be covered by its sustainable cocoa sourcing program, Cocoa Life. Nestle, Mars and every major chocolate processor have similar programs, as the growing demand for cocoa collides with the decreasing numbers of cocoa farmers, especially in developing nations, where most cocoa is grown. According to one report, most cocoa farmers survive on less than $2 per day. As a result, few new farmers are choosing that life. “Unless the cocoa sector fundamentally changes, there will be no future cocoa farmers,” says Antonie Fountain, managing director of the Voice Network and the Cocoa Barometer. But the sector is changing: By 2015, 16 percent of chocolate sales globally were made with certified sustainable cocoa, up from 2 percent in 2009. Like most larger food and beverage processors, General Mills has outlined several transparency goals by releasing energy conservation reports and data addressing a range of sustainability and environmental issues. “We are investing in the preservation of natural resources our business and the global population depend upon," noted Jeff Harmening, chairman and CEO of General Mills in a recent report. "Consumers increasingly demand food that reflects their values, from a company they trust. We believe using our scale for good is good for them, good for our business and good for the planet we share." The meat industry has been facing criticism over issues such as climate change, use of antibiotics and hormones and environmental concerns, but especially over animal cruelty. As a result, consumers search for animal welfare claims, such as grass-fed, free-range and cage-free, on meat packages. Meat companies are providing more information on sourcing, processing, farm practices, ethics, animal diets and animal welfare. Sales of conventional meat without any clean label claims have basically flatlined, observes Anne-Marie Roerink, a principal with 210 Analytics. Household meat consumption studies show consumers are most aware of the natural claim, followed by hormone-free and antibiotic-free, free-range, humanely raised and vegetarian-fed. "Millennials are much more likely to act on these claims," Roerink says. These are challenging times for the industry as it investigates where clean label goes from here. Free-from formulations will likely continue, but expanding beyond GMOs, gluten and other allergens to include glyphosate, maybe even aspartame. Technology is developing to support consumers' thirst for knowledge about their foods and drinks.